Joseph Baker & Sons took every opportunity to show their products at exhibitions overseas – Amsterdam in 1886, Adelaide in 1887, Barcelona in 1888 and at the 1889 International Exhibition in Paris. In 1889 they also exhibited machinery in Melbourne, Australia with such success that it was decided to open an office there. A variety of equipment was exported from Willesden ranging from chocolate-making machinery and travelling ovens to refrigerating equipment and gas plant for lighting and heating. 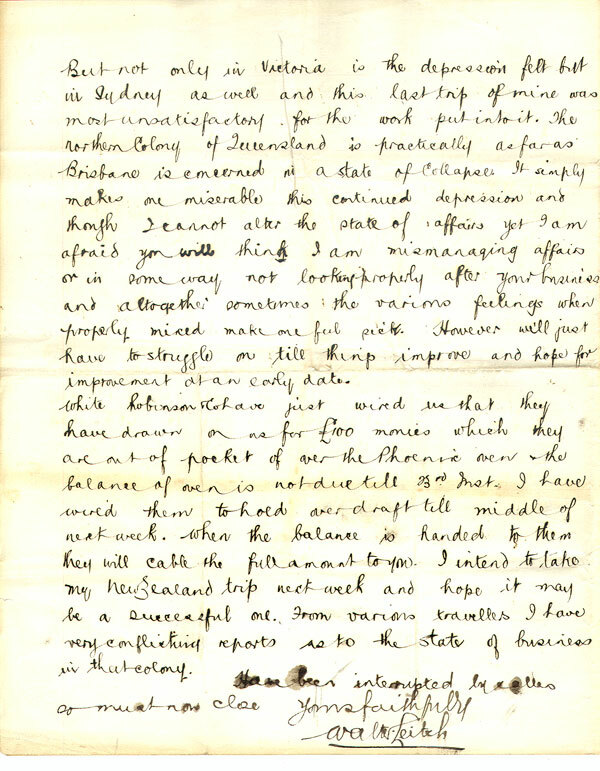 Walter Leitch 1893 - Letters from Walter Leitch to Head Office. Philip Baker and Walter Leitch ran the new office until Philip Baker returned to England on the death of his father. 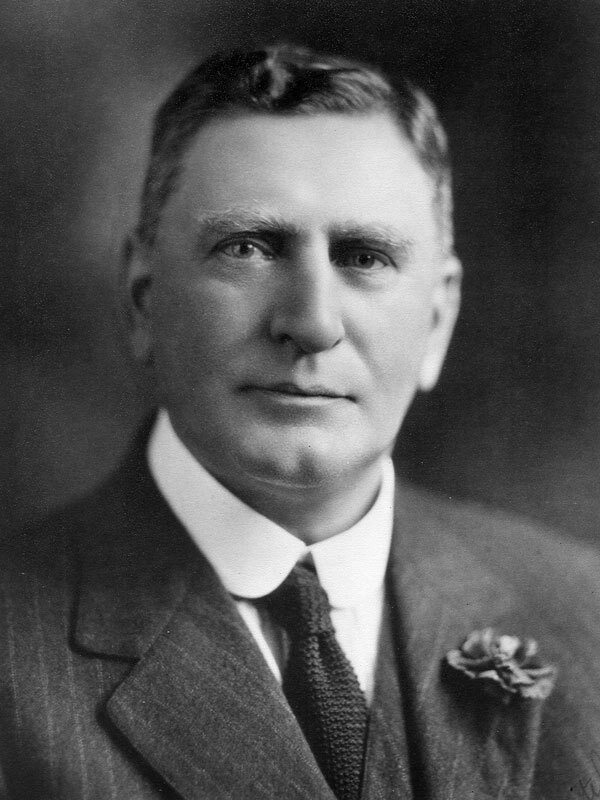 Walter Leitch was appointed manager and went on to become one of the outstanding citizens of Melbourne. The Bakers exhibited in New Zealand for the first time in 1890. The Perkins business had never been much interested in exporting but F.C. Ihlee had seen the possibilities of Australia as a market before World War One and in 1912 sent W.H. Lawrence to be a permanent representative in Sydney. He set up office next to the boardroom of the Master Bakers' Association and soon local bakers were calling in on him. The outbreak of war, after only two years of trading, cut off practically all of his supplies and, with the company name evoking similar hostile reaction in Australia as in England, F.C. 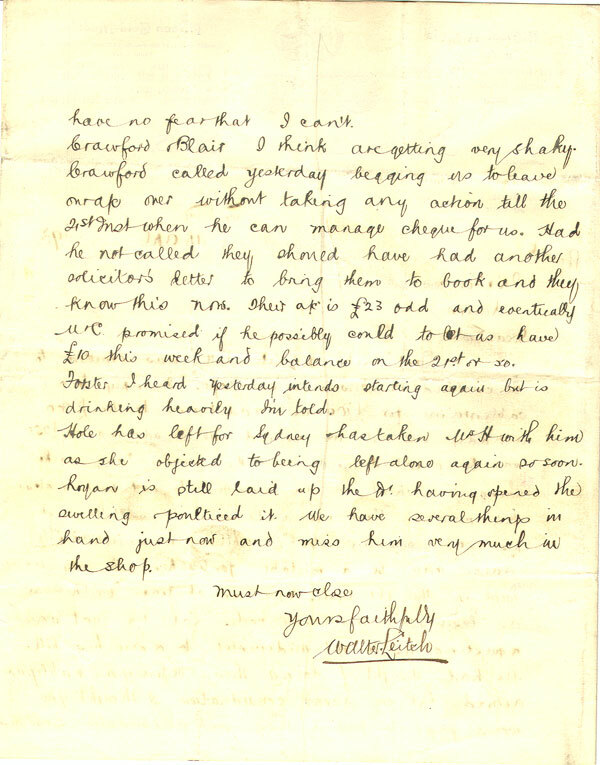 Ihlee suggested that Lawrence should return home. However, Lawrence remained convinced of the opportunities and. In 1916, in spite of the war, he opened a second office in Melbourne – which he considered to be a more central situation. Soon after his car was damaged in a road accident and his fitter, Ben Gordon, who superintended the installation and servicing of machinery, suggested that his brothers, who had set up a small engineering business in Port Melbourne, should repair the damage. The work was carried out so expertly that Lawrence asked them to quote for manufacturing parts for dividers and conical moulders. As a result, the manufacture of bakery machinery began in Australia. A small manufacturing company, Lawrence Perkins Pty. Ltd., was formed in 1917, in association with the Gordons. 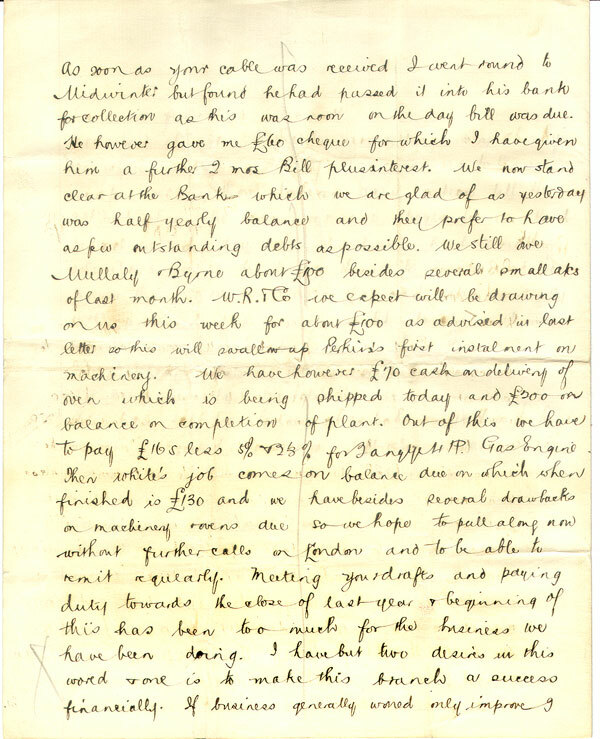 This prospered to the extent that their rivals in Australia, the representatives of Joseph Baker & Sons, saw their sales dwindling and asked Willesden what should be done about this Peterborough man who was capturing the market. Following the amalgamation of the Baker and Perkins businesses in 1919, the old Baker Office was closed and the premises in Collins Street became the Baker Perkins headquarters, with Lawrence in control. Equipment continued to be manufactured by the Gordon brothers, this work being transferred to Brunswick in 1919. Lawrence died in 1920 and it was some time before the managerial side of the business was as strong as it had been in his hands. His younger brother Jack went out from Peterborough to learn the business and later became a prominent member of the Baker Perkins company in Australia and New Zealand. J.G. Prior was a salesman in the organisation. Prior had been a Major in the Australian Army and was in charge of Australian Army Bakeries in Rouen in France during the war, where he met Major J.S. Baker. It was at J.S. 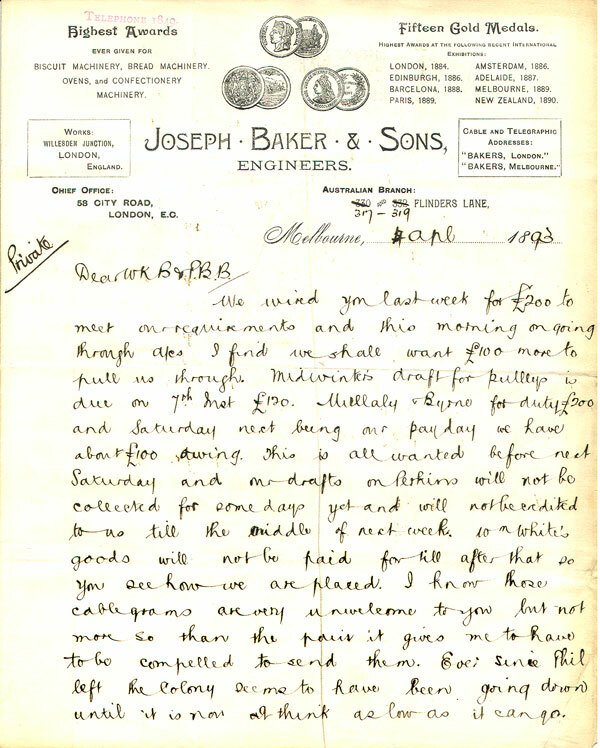 Baker's suggestion that Major Prior applied for a position as Salesman on his return to Australia. Following the death of W.H. Lawrence, Major Prior asked England for the opportunity of taking over as manager and was appointed. The staff in Melbourne was small in those days, consisting of Major Prior, Ben Gordon, Miss Hinson, two girls and an ovenbuilder. There was a branch office in Sydney at Daking House with R.T. Haines in charge. The Baker Perkins Annual report of 1921 stated that - "The business in Australia has made good progress during the year under the new manager, Major Prior". Good results were also reported for the next three years. Walter Leitch's assistant was Percy Collingwood Oake, who had come from the Willesden factory of Joseph Baker & Sons Ltd. P.C.Oake left the firm and became secretary of the Melbourne Chamber of Commerce. Walter Leitch became Director of Munitions in Australia during WW1 and was knighted in 1933 and as Sir Walter Leitch became Agent-General for Victoria in London. Baker Perkins exhibits were shown in the Australian pavilion at the Wembley Exhibition of 1924 (See also Trade Exhibitions), and in the following year Allan R. Baker went out to review the entire Australian business. He arranged that Gordon Brothers Pty. Ltd (a company formed in 1923) would receive capital from Baker Perkins in exchange for a minority of Shares. A subsidiary company, Baker Perkins Pty. Ltd., was also formed to absorb the old Australian sales agency. Lawrence Perkins Pty Ltd had ceased its operation in 1918, transferring its stock and plant to Gordon Brothers, who continued to manufacture oven ironwork and machines such as dough dividers for Perkins Engineers Ltd. By 1923, a number of extensions had been made to the factory in Brunswick and additional equipment was being made for Joseph Baker Sons & Perkins Ltd. In 1925, with the signing of a trading agreement between Baker Perkins Pty and Gordon Brothers Pty, Ben Gordon became a director of Baker Perkins Pty, continuing in this role until his death in 1933. The youngest brother, Ed, was Secretary of Baker Perkins Pty in addition to his duties with Gordon Brothers until 1941. In 1957, land was purchased at Reservoir on which a modern factory was built for the manufacture of ovens and final provers, etc. Early in their careers, Gordons had also commenced the manufacture of refrigeration plant - later expanding into air-conditioning plant - and this became a very successful part of their business. Sam Moscrip, the youngest brother of Mrs Joseph Allen Baker, had started with Joseph Baker & Sons in 1879 and was a salesman with worldwide experience. He settled in New Zealand in 1924 as the firm's first agent. Jack Lawrence joined him to install bakery equipment shipped from England, remained to make further installations as new plant arrived, and eventually took Moscrip's place. Jack Lawrence, "with a bag of tolls in one hand and a bag of catalogues in the other", took over the whole country, travelling about by any means available. It was not until 1937 that he had a motor car, which he used as his office, often being away from home for months at a time. For many years he was the only Baker Perkins salesman and engineer regularly travelling over both islands. A large amount of laundry equipment was sold over the years in both Australia and New Zealand (see also History of Baker Perkins in the Laundry Business). The Laundry Department of Baker Perkins Pty was begun in 1926 by H.W.H. Hale. Equipment was sold to both private laundries and hospitals, particularly in New Zealand - the Prosperity washing machines becoming the standard in New Zealand, being sold in considerable numbers long after England had given up selling then due to their high cost. At one stage, England was making them solely for the New Zealand market. The sale of Automatic Bakery Plants began in 1926 and good results were confidently expected. 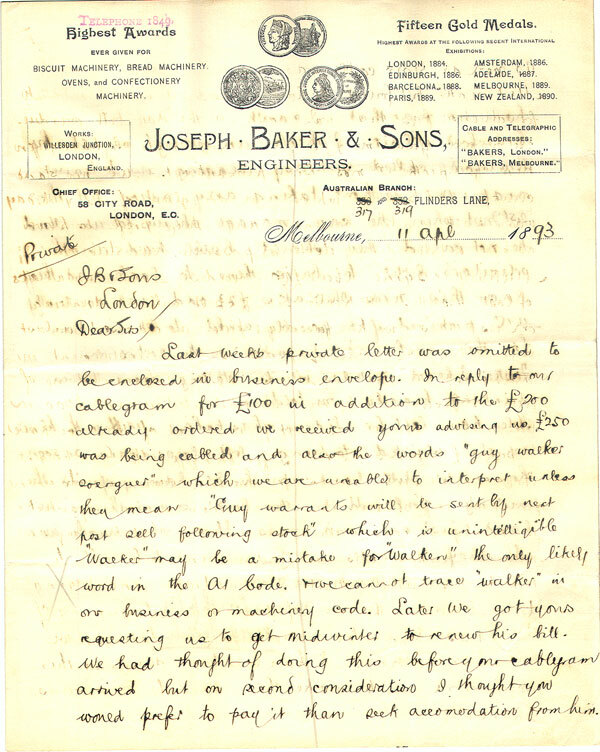 The ill health of both Major prior and Mr Ben Gordon prompted a visit from Mr. Allen R. Baker in 1928 who arranged for technical help from England to ensure the satisfactory performance of the Automatic bakeries installed in both Australia and New Zealand. The Australian company showed a small loss in 1930 as a result of which Allen R. Baker again visited Melbourne, installing Thomas Hatton as Managing Director. Business results fluctuated until 1935 when a small profit was achieved. Significantly better profits were achieved in 1936 and continued until the outbreak of the War. Inevitably, the impact of the War was significant and turnover suffered but the company continued to make satisfactory profits throughout. However, results were affected by a prolonged strike of mechanics in 1946. During the Second World War, Gordon Brothers diverted a major part of its production to war materials, manufacturing cordite mixers, bullet-testing ovens, blood-bank equipment and portable ice-making plants. With the end of the war in the Far East, Baker Perkins Pty. Ltd. lost no time in resuming normal trading and, in 1946, G.B.G. King, son of L.H. King, went out to take control in Melbourne. With an increasing level of orders Gordon Brothers found it necessary to enlarge their factory and to finance the project, Baker Perkins Pty. Ltd. bought a further £A40,000 of ordinary shares. The post-war protectionist policy adopted by the Australian Government meant that more and more products had to be manufactured by Gordon Brothers rather that be imported from Westwood Works. Max Schurmann was the Technical Manager/Chief Engineer responsible for the transfer of design data and drawings from Peterborough and the conversion where necessary to suit the manufacturing requirements of Gordon's. This liaison with Peterborough involved periodic visits to the UK. A Baker Perkins inspector located in an office adjacent to Gordon's factory reported to him on all technical and quality matters. In spite of Government restrictions on importation, the company reported improvements in profits throughout the early 50's. New premises for technical and administrative staffs in the suburb of Gardiner, Melbourne were acquired in 1955. Record levels of turnover and profits were achieved throughout the second half of the 50's. and early 60's with BP New Zealand doubling its turnover. The range of bakery equipment involved during the 50s included the Reciprocating Head Divider, Conical Hander, Intermediate Prover, Multi Spindle Moulder, Travelling Tray Final Prover, and the Travelling Tray Indirect Oil Fired Oven.Also during the Fifties, Australia saw the introduction of sliced and wrapped bread in waxed paper wraps, the forerunner to the plastic bagged loaves of today. Max Schurmann was involved in the implementation of the local manufacture of the National Reciprocating Bread Slicing and Wrapping machine and the technical transfer from Forgrove. This was one of the most successful bakery machines introduced by Baker Perkins Australia. As the New Zealand market grew in importance, a separate New Zealand company was created in 1954, with its headquarters in Auckland but under the control of the Australian company. Jack Lawrence became its managing director with G.B.G. King as chairman. In 1955, a social get-together at the home of one of the employees was the impetus to form what turned out to be a very successful Social Club. Under the presidency of Norman Threadgold of the Drawing Office, functions took place throughout the year culminating in a Dinner-Dance at Christmas and a Children's Christmas party. Australia experienced a set back in 1964, resulting in a small loss but this was reversed in the following year when nearly 50% of the total turnover of the two companies was manufactured either at Gordon Brothers, Melbourne or in Auckland. 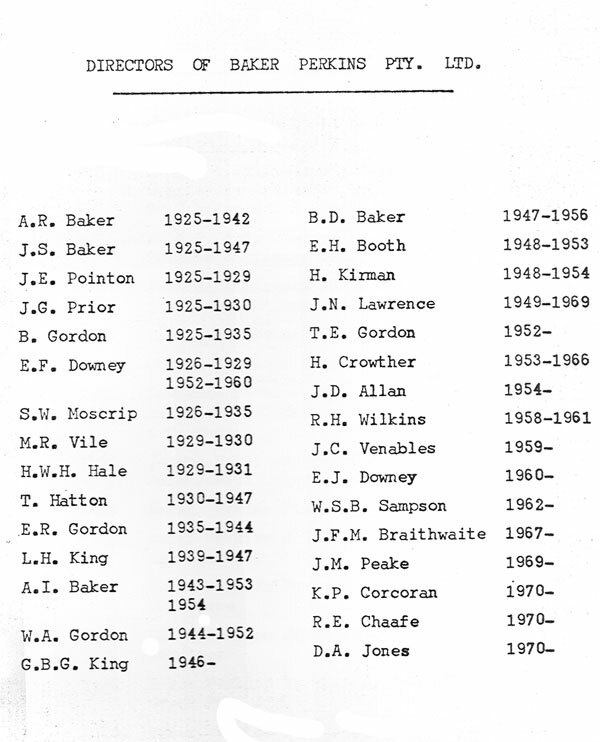 The group's 1967 Annual Report indicated that the share capital of Baker Perkins Pty. Ltd. Australia was increased by a scrip issue from Aus$100,628 to Aus$1,000,000, providing a sound base for its future expansion in Australia. It also confirmed the group's 40% stake in Gordon Brothers Pty. Ltd.
Profit and turnover growth continued through the late 60's and, in 1969, Baker Perkins Pty. Ltd purchased the business of its main competitor in Australia, Thermo Radiant Ovens Pty. for £470,000. Thermo Radiant employed 120 in Springvale, Victoria and manufactured bread-making equipment that was to be made available alongside Baker Perkins' products. Thermo Radiant had been started by Les Wilson, a bricklayer who built brick ovens and then small electrically heated ovens. He followed these with electrically heated tray ovens. An outside consultant designed an oil-fired heating system for him and his first oil-fired travelling tray oven was installed in St. Kilda by 1951. With experience and a capable staff, a wider range of ovens at prices which customers could afford allowed him to obtain a large portion of the Australian oven business. He built final provers, some coupled to ovens to from automatic plants. A tray type bread cooler, together with a depanner, completed the automatic plants. Wilson developed an automatic lidding device for tray ovens which proved very successful as will be seen later. These acquisitions brought a dramatic change in the fortunes of Baker Perkins Pty. In the preceding 50 years or so, the company had operated as a growing infant of Baker Perkins Ltd and had - "the aspirations, lack of experience and - in terms of its wish to become an independent design and manufacturing source - a degree of over confidence". The acquisition of Gordon Brothers and Thermo Radiant resulted in a transfusion of people who, while lacking the experience of operating in a worldwide organisation, possessed the manufacturing and design skills which were derived from the experience of an independent existence. The partners in the new Baker Perkins Pty came together with little or no friction from old rivalries. With this growth of the group's assets in Australasia, John Peake was appointed as managing director in the same year. The necessary non-recurring costs associated with the rationalisation of these acquisitions resulted in a small loss being incurred in 1970 and 1971. The existing office building in Melbourne was sold in 1972 and a new headquarters building erected on the Springvale site. The sub-group returned to profit in 1972 with the sale of properties at Reservoir and Gardiner in Melbourne. “In retrospect, I am inclined to believe this was the best arrangement. Australia is so highly urbanised, with the bulk of the population living in a few big cities, the chance of retaining apprentices after their training is poor (i.e. their mobility is high). It is however possible that in the mining industries located in the back blocks of Queensland and Western Australia the situation may well be different”. By 1974, Baker Perkins Pty could claim to hold some 70% of the Australian market for all types of bakery machinery - this share tending to increase rather than reduce. There was only one other competitor with a significant market share - Sterling, a subsidiary of British American Tobacco - other international competitors such as Spooner, Lanham and Werner & Pfleiderer not yet having gained a foothold. At this time, the company's share of the South African oven and baking plant market was estimated at around 33%. (See also History of Baker Perkins South Africa Pty Ltd). The New Zealand company's primary business had been the import of group products but, by 1974, production staff had been strengthened and it had begun to manufacture about a third of its total turnover, including bakery machinery to Australian designs. A step change came at the end of 1978 with the purchase of the goodwill and assets of Industrial Heating Co. Ltd. of Auckland and Christchurch, giving the company a near monopoly of the industrial bakery machinery business in New Zealand. Jack Barnard, who was now in charge of Baker Perkins NZ was given the task of putting the two businesses together. 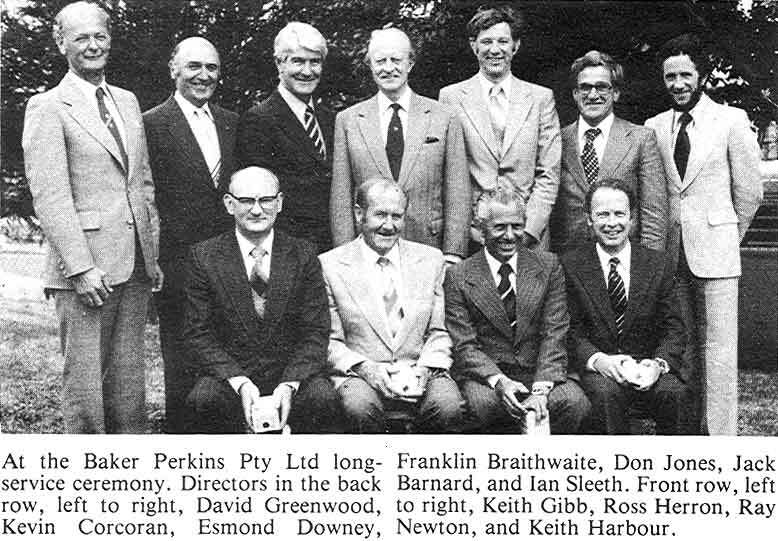 In 1975, John Peake transferred to the USA and Harry Childerley became managing director of Baker Perkins Pty. At that time, the sub-group employed 510 people and sold laundry equipment and packaging machinery imported from the UK as well as bakery equipment of its own manufacture. Don Jones, who was general manager of Thermo Radiant when it was acquired in 1969, was appointed managing director of Baker Perkins Pty. Ltd. in 1977. The sub-group suffered an overall loss in that year and an extensive programme to re-structure the Gordon business was put into place, resulting in the company beginning to withdraw from the refrigeration and air conditioning contracting business. By 1978, turnover had reached nearly £10m and profit growth was at a satisfactory level. In New Zealand the two businesses – BP NZ and Industrial Heating were merged in Mangere. 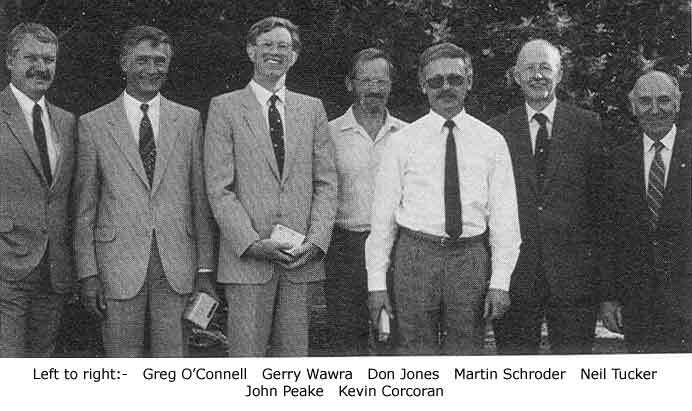 Turnover in Australasia reached nearly £11m in 1982 and, in order to more closely align the business with that of the group as a whole, Gordon's refrigeration and air-conditioning business was sold and the businesses of Sterling Industries Ltd, Sydney and Willett Industries of Brisbane were purchased. Manufacturing facilities were also expanded in Christchurch, New Zealand. Both the Australian and New Zealand businesses saw an increase in their export activities. New Zealand was beginning to show profits after a number of years of losses. Sterling was started by Walter Andrews who came to Australia from New Zealand, where he was a representative for a very successful agent for Artofex mixers, ovens, etc. He commenced selling Artofex products in Australia, eventually starting local manufacture of near copies of the Artofex mixer and gradually building up a substantial business in mixers, moulders, etc. Sterling strengthened the sub-groups presence in the industrial bakery equipment market while Willetts enabled early expansion of the retail bakery business that was first entered in 1980. Demand in Australia fell slightly in 1983 but New Zealand achieved exceptionally good results in 1984. Business results remained generally satisfactory up until 1987 and the merger between Baker Perkins and APV. 1984 saw a very significant number of early retirements and redundancies in the Australian business as a result of the recession and heavy cost increases in the metalworking industries. However, retail bakery activities continued to expand. The upward trend in Baker Perkins New Zealand's results also continued. 1984/85 was a year of record orders for industrial bakery plant and further growth in retail bakery with the Australian and New Zealand factories fully loaded throughout the year. In the following year, unprecedented growth occurred in the retail bakery market at the expense of industrial bakeries and this changed the whole nature of the Australasian business with retail bakery becoming the largest single business sector. 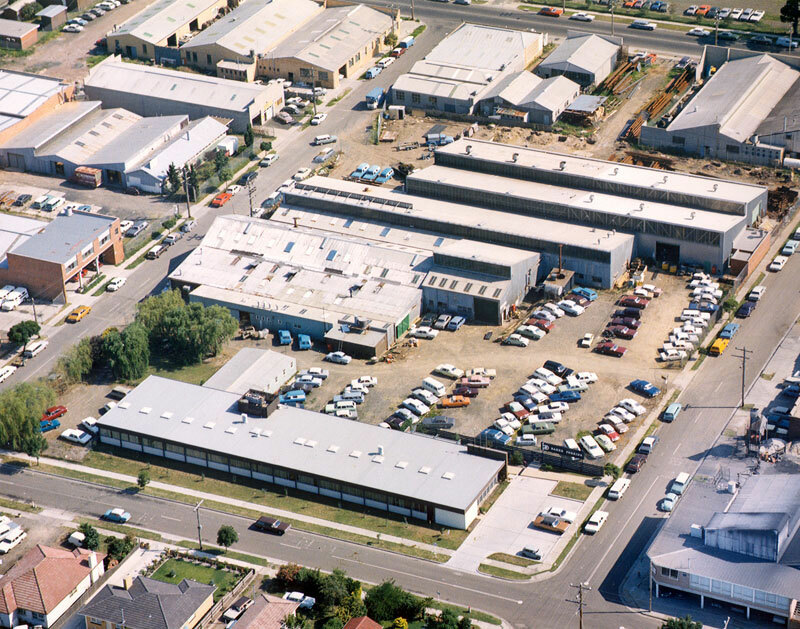 The factory at Clontarf, Queensland was expanded and a new retail oven factory built in Christchurch, New Zealand. Baker Perkins Pty Ltd had entered the USA retail bakery market in 1984, opening an office in Raleigh, North Carolina, under the direction of Chris Cipriani. Slow progress in meeting planned objectives at a time when Baker Perkins Pty. experienced a downturn in the domestic industrial bakery market, forced its closure only two years later. However, Chris was successful in arranging for Dawn Foods Inc, a supplier of ingredients to the US baking industry to take over the marketing of Baker Perkins' retail equipment in the USA. The Luke Equipment Division of National Consolidated Inc. Ltd. – the leading manufacturer and supplier of food catering machinery in Australia - was acquired in 1986. The company had a turnover of £6m with premises in Mitcham, Victoria. 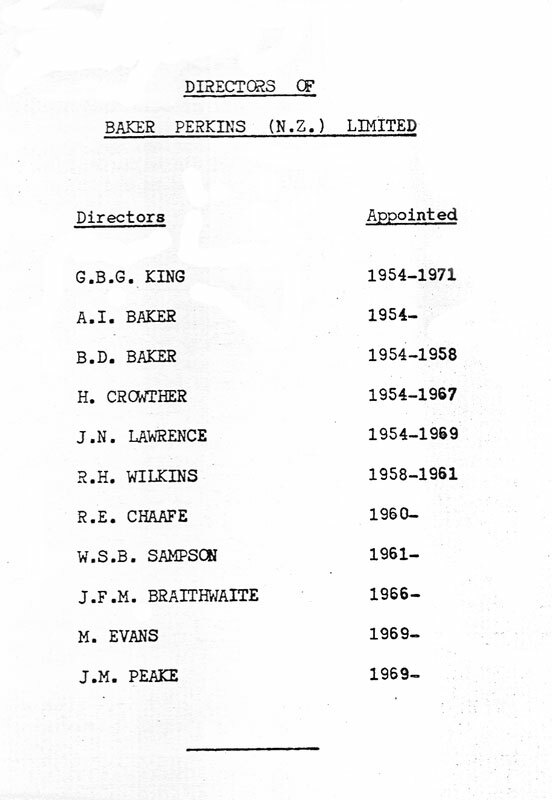 In March 1987, Baker Perkins merged with APV, Crawley (see History of Baker Perkins Holdings). Baker Perkins Pty and Baker Perkins (NZ) Pty became part of APV Baker Pty. The new group's investment in both retail and industrial bakery equipment continued (See History of Baker Perkins in the Bakery Business) and in January 1990 the entire issued share capital of Moffat Appliances Ltd, New Zealand was acquired for £2.9m. Telford Smith of Melbourne manufactured the first plastics extruder to be made in Australia just after WW2 and by the early 1950s, they were setting up complete lines to produce film, sheet, profiles and wire and cable covering. 1200 machines were at work all over Australia and New Zealand by 1989 when APV Baker Pty Ltd acquired the Company and formed a new division – APV Telford Smith. APV sold the Telford Smith business in July 1993. The Australasian Catering equipment and Retail Bakery businesses were sold in March 1996. Miss M. Robinson, G.B.G. King, J.Lawrence, T.D. Marsh, E.L.Ryan and J.C. Venables. At the Dinner-Dance in December 1970, a gold watch was presented on recognition of 35 years service to E. Lane.